"Principles of Epidemiology Lesson 3 Section 3"
This results in an age-specific death rate (ASDR) per 100,000 population for each age group. That is, for each age group, ASDR = deaths in age group ÷ estimated population of that age group × 100,000. The broad age groups for which specific rates of reduction were selected are: under age 15, ages 15-49, ages 50-64, ages 65-84, and age 85 and older. The postulated ultimate annual percentage reductions are shown in Table 3. 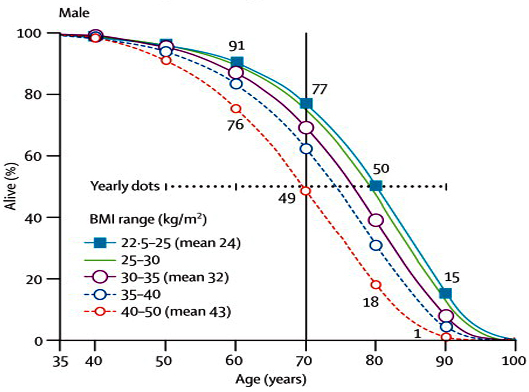 The age-adjusted rate can be considered an average of each of the individual age-specific rates, but rather than being a simple average, it is a weighted average with each age-specific rate weighted by the proportion of people in the same age group in the standard population.